An iron is capable of handling most wrinkles and creases. It could be monotonous, tiring and time wasting though. If ironing bores you like most people, or you are tired of the continuous hovering on your extra wide ironing board, there’s an alternative. You will have to settle for a digital steam press. Here are the 5 best digital steam press you should consider if you want to get one. Imagine having 100lbs force at your beck and call to straighten your garments. That’s the enormous power the Singer ESP-2 boasts of. It’s not just about the weight but the numerous features that make steaming enjoyable than traditional methods. All these amazing and ingenious engineering contributes to the reduction of your ironing time by at least 50%. The steaming surface, without exaggeration, is almost 10 times larger than your biggest iron. There’s a professional touch to the use of this digital steam press. You can set the machine to the exact temperature your material can handle. Keep your ears within reach, the alarm feature of the Singer ESP-2 will beep every 10 seconds to keep you abreast of the steam status. 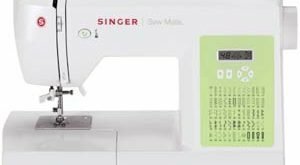 No matter the stubbornness of the wrinkle or the material itself, the concentrated steam technology of Singer ESP-2 will get it straightened. Interestingly, it comes in a portable and travel-ready size. There are a few shortcomings; the steaming surface isn’t large enough for XL shirts, and it takes more effort to understand working with the steam press. Overall, it is a good value for the money, a quality product that you’ll always recommend. You are about to start giving your garments a professional look with the Steamfast SP-660. The steam press is adequately equipped to handle a large variety of fabrics. Being a 1,300-watt powered steam press, expect nothing less but efficiency and quality. Relying on the automatic shut off feature, your garment is safe and secured from any form of damage. It is programmed to shut itself off with an alarm when it reached a temperature higher than what your material can handle. Steamfast SP-660 has a 10-ounce tank that gets heated in just 3 minutes, and it is ready for work. The steam press is packaged with adequate accessories that make steaming easier and faster. From any of the 5 pre-programmed fabric settings, there’ll be one that fits the bill. There’s a setting for linen, wool, nylon, cotton, and silk. Depending on your need, the steam burst button will provide enough steam for stubborn wrinkles. What you may see as a problem is a long wait for recharging the steam burst. Nonetheless, it is considered more suitable for shirts. SpeedyPress was designed to cater for extra large garments with almost 50% larger surface than the most available digital steam press. It is not just an elephant by mass but with advanced features that make ironing look archaic. You may want to measure to prove your doubts, but this is not less than 24 times larger than your regular iron. Picture the number of minutes you will save while trying to get crispy and professional looking fabric. Even if you are interested in steaming multiple layers of fabrics, SpeedyPress is capable of handling it. With the 35 by 12.5 inches surface size, you will be cutting off 60% of your ironing time. As an advanced steam press, there’s a LED screen that displays the exact temperature you are operating. You may decide to settle for an automatic or manual steaming. Lastly, heat up time is faster than every other steam presses you’ve ever used. If the water tank is larger, it would have been commensurate with the size of the steam surface. Meaning you may run out of steam and the garment is not yet done. Nevertheless, the size and features make up for the little weak point. Most suitable for extra-large garments or industrial applications. Built for a variety of fabrics as the nonstick Teflon surface can accommodate fabrics as delicate as silk and nylon, or tough ones like wool and cotton. For the most stubborn wrinkles, you have a steam burst that erases any trace of wrinkling. From the 10 oz take, it supplied water for steaming, quite adequate for single item ironing. You’ll know when the steam burst is ready via the digital display equipped with the steam press. Solely for your safety, the machine has an automatic shut-off feature which ensures your fabrics are safe. This machine is not too heavy to move within the house and doesn’t take much space if you need to travel. The heat up time of the SteamFast SF-680 is the only downside, takes a bit longer than your regular iron. 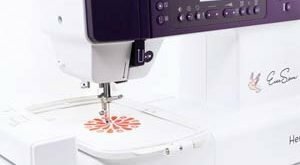 For the simple digital control and professional look, it gives your fabrics, SteamFast SF-680 should be on your choice list. When you think you’ve seen it all with the digital steam press, you have in your front an ultra-sized machine called SpeedyPress. With SpeedyPress. steaming is eco-friendly and time-saving. Therefore, a good choice for a big family, especially those with many children. This machine releases to your fabrics 38 jets of steam which eliminate the most stubborn wrinkles and bacteria in one swoop. From the digital screen, you can select the fabric type and needed temperature. 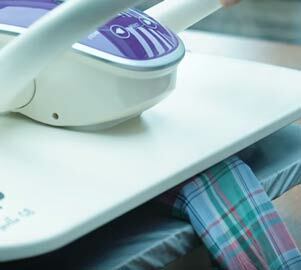 Anywhere you need to iron, the collapsible handle makes mobility easier. Interestingly, the steam surface is as large as a conventional ironing board. On the downside, the heat up time is a concern. However, immediately it does, steaming becomes fun. Once you can understand the functionality, you’ll appreciate the machine. I will recommend this digital steam press for a large family or industrial usage. 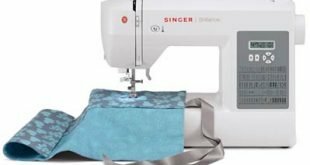 Singer ESP-2 Electronic Steam Press is a good option to consider if you are in on budget. It does what it should do – smoothing cloths. SteamFast SF-680 Digital Steam Press is equipped with advanced features a professional will always love. Lastly, if you have a large family, sew or do a lot of quilting, I’ll recommend SpeedyPress Oversized Iron Press. According to statistics, an average woman spends 4 months of her entire life ironing. A digital steam press can reduce your ironing time by at least 50%. It’s time to start steaming and stop ironing!